Each Cape Region spring brings a familiar run of migrating fish, including tautog, bluefish, and flounder. This year’s fish travels included a new specimen–but this one is related to golf. It is plastic, and mounted on a fake wooden plaque. It memorializes a record of golfing futility among participants in the annual Conlon Brothers golf outing, including Kevin Conlon, Nick DelCampo, and me. This Fish looks like a miniature shark, and also sings “Mack the Knife”—badly. I managed to “win” The Fish this year, with a distinctly wretched performance only slightly the fault of the tough golf courses we played. My victory came from posting the highest net score among the dozen competitors. Their handicaps range from a legitimate 12 to some questionable high 20s–I’m beginning to question some of them, anyway. Our first round took place at River Hills Golf & Country Club in Little River, South Carolina (800-264-3810). We began play on the back nine. Eight of those holes present water hazards that can easily be the final resting spot for a golf ball hit with a hard-struck hook, a gentle draw, a slight push, or a deflating slice off the tee. 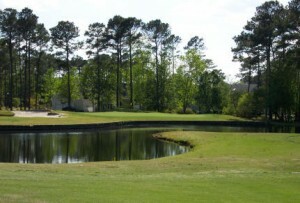 The fourth hole at River Hills Golf Club, South Carolina, features water for much of the approach shot to this medium-length hole. Five holes on the front nine also feature similar watery targets, and I found a few more. In fact, I lost eight golf balls in the first ten holes. My experience was pretty common among our group—it was just a question of degree. I announced that “The Fish is mine!” as we joined the others in the parking lot after the round. I was simply stating a likely fact, thanks to my 116 total. Somehow this remark generated a huge laugh. Actually, the course was beautiful, as well as challenging. If we played it again, however, we wouldn’t make it our first round destination after a long winter break. We traveled the next day to the impressive Black Bear Golf Club, in Longs, SC (800-842-8390). Our group loved the park-like setting and the flawless greens, as well as the fact that the water hazards weren’t nearly so threatening. I managed to bring my score down far closer to my handicap, but a few blow-up holes still kept me in first place among the Fish candidates. Our third round returned us to a past favorite, the Lion’s Paw Golf Links in Sunset Beach, NC (800-233-1801). Dropping back to a three-wood from the driver helped on many holes, but butchering several sand trap shots didn’t erase my Fish chances at all. When your pars are outnumbered by your triple bogeys, that’s not good. The fourth and final round in The Fish competition took place at another layout we enjoyed previously, the Avocet course at Wild Wing Plantation (800-736-9464). It also gave us a good example of the recent retrenchment from the overbuilding of Myrtle Beach golf developments in the last fifteen years. The Wild Wing complex formerly had four 18-hole courses. A Japanese firm sold the property to a consortium of Myrtle Beach businessmen in 2005. They converted three of the courses into new housing developments. Avocet remains a good layout, with plenty of challenges off the tees, on the approaches, and on the greens. We learned not to trust the pin location guides, which were wrong on too many occasions. That problem helped me secure The Fish, but it certainly wasn’t the main reason for achieving this dubious distinction. Our last round took place at The Meadowlands Golf Club, in Calabash, NC (888-287-PLAY). Compared to our previous courses, I was less impressed with this one as a resort layout. Several holes demanded prior course knowledge to keep from hitting into big trouble. After a few rounds to learn what not to do, however, it would be fine for regular members. I have a new goal for next year’s outing. Any future Fish migration to the Cape Region will not include me. The Viking golf team for Cape Henlopen High School finished in fifth place overall in the Henlopen Conference tournament held May 21 at Kings Creek Country Club. Dino Nardo’s 84 was the best team score, and was also good for 14th place overall. Travis Parker followed Nardo by a single stroke, and Samantha Purple finished one stroke behind him. Tristan Karsnitz’ 89 completed the team scoring. The final competition for the 2007 Vikings is the state championship, to be held May 29-30 at the new Bayside Course near Fenwick Island.